<yawn>! Oh. My. Goodness. I really did have a great show at the “Fall Thing” in Phinney Ridge! I sold a few Tote2Go!s and even some jewelry that I managed to dig out of the depths of my backstock drawers. I had forgotten how different retails shows are from wholesale trade shows! The customers, for instance. At a trade show, they are really obviously “looking to buy” the next best thing on the market. They scan and stop only if something truly catches their eye. When they do stop, they usually want to hear all about your work so they can decide if it’s right for their store. At a craft show, I’d say a good portion of the shoppers are crafters too — so when they stop to look, they’re sometimes just checking out the craftsmanship and/or the price point. (That’s all cool with me. To be honest, I do it too) And the other people are really just taking some time out of their weekend hoping to find that perfect holiday gift a little earlier this year…knowing full well that they may just find themselves at Target on Christmas Eve. Augh! Personally, I’d really like to give and get a 100% handmade holiday this year. In retrospect, relying on big-box retailers has created more stress than it’s worth — running here, there and everywhere trying to find the store with the right item at the right price…then trying to find the right gift wrap and card and…oh my. I’m getting stressed out just thinking of it. Wouldn’t it be great to know that by purchasing something from an artist and/or an artist-friendly boutique you’d be supporting small businesses and making an immediate difference in the life of an artist? Heck ya. That’s a Happy Holiday in my book! 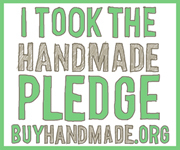 Etsy.com has created a website dedicated to this concept…check it out and take the pledge to Buy Handmade this holiday! Yay! Check out the post and come back on October 15th to see my official BlogActionDay post! My Tote2Go! totes really started with a pile of scrap fabric given to me by Julie Charles of CommonObjectJewelry.com — she put these amazing Ikea drapes up in her house(boat) and gave me the yards and yards of fabric she trimmed off the ends! The concept was to make a reusable grocery tote that was super-cute and sturdy, so I used an actual plastic grocery bag as the original pattern. Since then, I’ve created my own pattern (see my previous post) and but still only use recycled, reclaimed and remnant fabrics for all my totes and purses. It forces me to be creative and uses fabrics that would eventually end up in the trash bin…I love it! Okay. First, let me say that I love, love, LOVE living in Seattle. I’ve been all over the country and have to say, this is my Home. I love everything about it…save for one thing: The lack of a truly cohesive, supportive creative community. Granted, Carrie and the members of the newly formed EtsyRain (aka: Etsy Seattle street team) are doing what we can to change all of that…but change is slow going here in the Emerald City. When it comes to coordinating and encouraging a bunch of crafty individuals to get out of their homes/studios and get together to make things really happen, nothing can top what Portland (OR) has done for themselves! For example: They’ve got Sister Diane who runs CraftyPod and DIY Alert (amongst other things!) 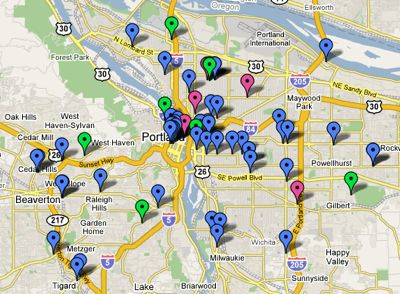 who has recently posted THIS — “Mapping the Crafty” — a Google Map showing all of the craft / DIY shops, boutiques, supply stores and even places to learn stuff on one convenient map! I can’t even imagine how much work went into creating such a thing…it’s amazing. Rock on, Sister Diane — you are truly awesome. I’ve been making and selling stuff all my life. I started with little beaded earring in Jr. High school — making them and selling them to my friends for their lunch money. Mini-entrepreneur! That was me. I guess it was all my mother’s influence. She used to make dolls and sell them at craft fairs and consign them to shops. I have fuzzy memories of seeing her handiwork on folding tables and on store shelves. I think she did pretty well with it, though she’d say otherwise. I eventually went on to emulate her by making some sterling silver jewelry and selling them at retail shows all over Southern California. It was fun, difficult at times…but a great learning ground for things to come. It all led me to eventually starting my business: Marlo M. Jewelry Design in 1993. I almost immediately quit my “day job” at a restaurant and started doing more retail shows. That let me to participating in trade shows in 1996 and kept doing them up to 6 times a year at the peak of things until 2004 when life got complicated and I got tired of traveling. I moved to Seattle in 1997 and started a mentoring program for emerging artists. They would come and help me in my studio and I’d show them how to start their own line to sell. Mostly jewelry, but others too – purses, accessories, paintings. I had So much fun teaching them the basics…and I’ve made life-long friendships to boot! Out of over a dozen people who have come and gone in my studio, 2 of them actually started a line of product and started selling it to stores. The others disappeared (sometimes literally!) and others just said, “Wow. I had no idea how much paperwork was involved in selling my stuff! I’m going to go back to my day job and just do this as a hobby!” I’m glad to have helped them figure that out before they quit their jobs. Toward the end of the discussion, the OP said, “You should write a book!”. Funny — since I have been sitting on an outline for a crafts/business/self-help style book for years now. Perhaps this is the time to do it? I’m seriously considering it. It would probably end up being a sort of Q&A with questions that I hear all the time like, “How do I price my work?” and “How do I sell to stores?” to “I hate being rejected! How do I get past it?” — there are so many newbie questions that get asked over and over and over. The place where we ALL started. Helping others on the path to success widens the road so more can get there. That one is mine. At least, I think no one else has said it quite like that. Anyway, living this belief is what I want to be known for. I am just wowed by all the creative energy that is going on around the country…so inspiring!!! Comments Off on Cute stuff in the movies!